We see the world the way we are. Our orthodoxies blind us to new opportunities. But if we give ourselves a methodology to challenge those orthodoxies, understand and harness trends and leverage our resources, we can reverse-engineer the innovation process. People need freedom to accommodate constant change. You’ll know you’re giving your teams the right amount of freedom when you’re giving them just a little more than you’re comfortable with. We are building, but in the digital reality we are building so many things on shifting sands. While we are building, we need to build a capacity for change. 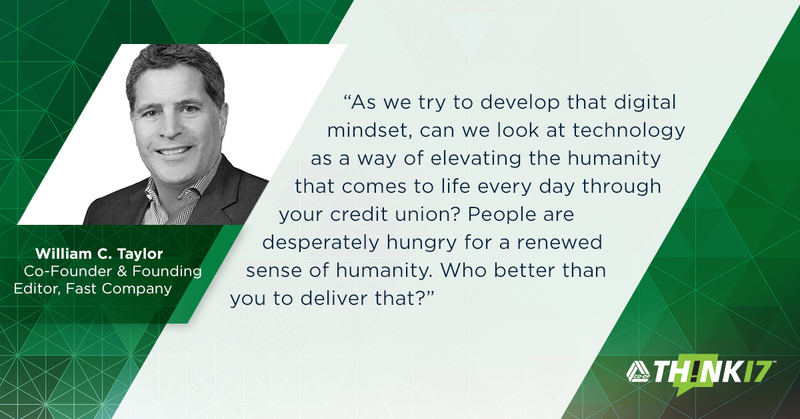 Credit unions are the original share economy. Uber and Airbnb may be in the news, but credit unions have been doing this for years. The better we are at our jobs, the harder it is to open our eyes and open our minds. We allow what we know to get in the way of what we can imagine. We will continue to follow your Digital Transformation Journey, provide you valuable insights and will bring the CO-OP Roadshow to your town. We wanted to take this opportunity to thank you for active participation and collaboration to turn THINK 17 into a memorable experience. Next stop: The Jobs To Be Done Webinar – How to ensure Success. Register now for the June 7 event. And join us for THINK 18 in lovely Arizona. We can’t wait.